Spring Web Flow (SWF) aims to be the best solution for the management of web application page flow. SWF integrates with existing frameworks like Spring MVC and JSF, in both Servlet and Portlet environments. If you have a business process (or processes) that would benefit from a conversational model as opposed to a purely request model, then SWF may be the solution. SWF allows you to capture logical page flows as self-contained modules that are reusable in different situations, and as such is ideal for building web application modules that guide the user through controlled navigations that drive business processes. For more information about SWF, consult the Spring Web Flow website. Clear separation of roles. Each role — controller, validator, command object, form object, model object, DispatcherServlet, handler mapping, view resolver, and so on — can be fulfilled by a specialized object. Non-Spring MVC implementations are preferable for some projects. Many teams expect to leverage their existing investment in skills and tools, for example with JSF. If you do not want to use Spring’s Web MVC, but intend to leverage other solutions that Spring offers, you can integrate the web MVC framework of your choice with Spring easily. Simply start up a Spring root application context through its ContextLoaderListener, and access it through its ServletContext attribute (or Spring’s respective helper method) from within any action object. No "plug-ins" are involved, so no dedicated integration is necessary. From the web layer’s point of view, you simply use Spring as a library, with the root application context instance as the entry point. Your registered beans and Spring’s services can be at your fingertips even without Spring’s Web MVC. Spring does not compete with other web frameworks in this scenario. It simply addresses the many areas that the pure web MVC frameworks do not, from bean configuration to data access and transaction handling. So you can enrich your application with a Spring middle tier and/or data access tier, even if you just want to use, for example, the transaction abstraction with JDBC or Hibernate. 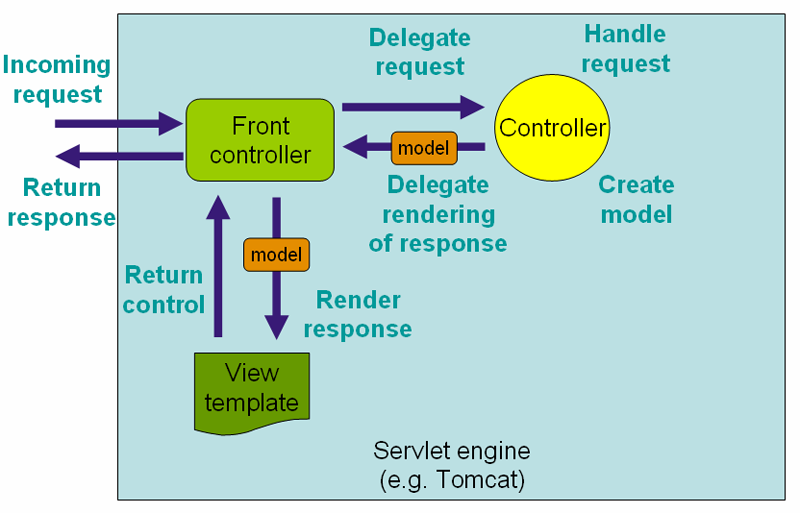 如图，展示了 Spring web MVC DispatcherServlet 处理请求的流程。 The request processing workflow of the Spring Web MVC DispatcherServlet is illustrated in the following diagram. The pattern-savvy reader will recognize that the DispatcherServlet is an expression of the "Front Controller" design pattern (this is a pattern that Spring Web MVC shares with many other leading web frameworks). 如 Section 5.15, “Additional Capabilities of the ApplicationContext” 所描述那样，在Spring里可以获取到 ApplicationContext 实例。在 web MVC 框架，每一个 DispatcherServlet 都拥有自己的 WebApplicationContext，这个 WebApplicationContext 继承了根 WebApplicationContext 定义的所有 bean. As detailed in Section 5.15, “Additional Capabilities of the ApplicationContext”, ApplicationContext instances in Spring can be scoped. In the Web MVC framework, each DispatcherServlet has its own WebApplicationContext, which inherits all the beans already defined in the root WebApplicationContext. These inherited beans can be overridden in the servlet-specific scope, and you can define new scope-specific beans local to a given Servlet instance. Stores and retrieves the "input" and the "output" FlashMap that can be used to pass attributes from one request to another, usually across a redirect. In Section 16.16, “Configuring Spring MVC” you’ll learn about other options for configuring Spring MVC including MVC Java config and the MVC XML namespace both of which provide a simple starting point and assume little knowledge of how Spring MVC works. Regardless of how you choose to configure your application, the concepts explained in this section are fundamental should be of help to you. Controllers provide access to the application behavior that you typically define through a service interface. Controllers interpret user input and transform it into a model that is represented to the user by the view. Spring implements a controller in a very abstract way, which enables you to create a wide variety of controllers. Spring 2.5 introduced an annotation-based programming model for MVC controllers that uses annotations such as @RequestMapping, @RequestParam, @ModelAttribute, and so on. This annotation support is available for both Servlet MVC and Portlet MVC. Controllers implemented in this style do not have to extend specific base classes or implement specific interfaces. Furthermore, they do not usually have direct dependencies on Servlet or Portlet APIs, although you can easily configure access to Servlet or Portlet facilities. You use the @RequestMapping annotation to map URLs such as /appointments onto an entire class or a particular handler method. Typically the class-level annotation maps a specific request path (or path pattern) onto a form controller, with additional method-level annotations narrowing the primary mapping for a specific HTTP method request method ("GET", "POST", etc.) or an HTTP request parameter condition. In some cases a controller may need to be decorated with an AOP proxy at runtime. One example is if you choose to have @Transactional annotations directly on the controller. When this is the case, for controllers specifically, we recommend using class-based proxying. This is typically the default choice with controllers. However if a controller must implement an interface that is not a Spring Context callback (e.g. InitializingBean, *Aware, etc), you may need to explicitly configure class-based proxying. For example with <tx:annotation-driven />, change to <tx:annotation-driven proxy-target-class="true" />. Spring 3.1 introduced a new set of support classes for @RequestMapping methods called RequestMappingHandlerMapping and RequestMappingHandlerAdapter respectively. They are recommended for use and even required to take advantage of new features in Spring MVC 3.1 and going forward. The new support classes are enabled by default by the MVC namespace and the MVC Java config but must be configured explicitly if using neither. This section describes a few important differences between the old and the new support classes. Prior to Spring 3.1, type and method-level request mappings were examined in two separate stages — a controller was selected first by the DefaultAnnotationHandlerMapping and the actual method to invoke was narrowed down second by the AnnotationMethodHandlerAdapter. With the new support classes in Spring 3.1, the RequestMappingHandlerMapping is the only place where a decision is made about which method should process the request. Think of controller methods as a collection of unique endpoints with mappings for each method derived from type and method-level @RequestMapping information. This enables some new possibilities. For once a HandlerInterceptor or a HandlerExceptionResolver can now expect the Object-based handler to be a HandlerMethod, which allows them to examine the exact method, its parameters and associated annotations. The processing for a URL no longer needs to be split across different controllers. Select a controller first with a SimpleUrlHandlerMapping or BeanNameUrlHandlerMapping and then narrow the method based on @RequestMapping annotations. Rely on method names as a fall-back mechanism to disambiguate between two @RequestMapping methods that don’t have an explicit path mapping URL path but otherwise match equally, e.g. by HTTP method. In the new support classes @RequestMapping methods have to be mapped uniquely. Have a single default method (without an explicit path mapping) with which requests are processed if no other controller method matches more concretely. In the new support classes if a matching method is not found a 404 error is raised. The above features are still supported with the existing support classes. However to take advantage of new Spring MVC 3.1 features you’ll need to use the new support classes. @PathVariable 参数可以是任意的简单类型（如 int，long，Date 等），Spring 会自动将其进行类型转换，转换出错会抛出 TypeMismatchException。你可以注册支持解析其他数据类型，详情请看 the section called “方法参数和类型转换” 和 the section called “自定义 WebDataBinder 的初始化”. For the full details see AntPatternComparator in AntPathMatcher. Note that the PathMatcher can be customized (see Section 16.16.9, “Path Matching” in the section on configuring Spring MVC). The URI specification RFC 3986 defines the possibility of including name-value pairs within path segments. There is no specific term used in the spec. The general "URI path parameters" could be applied although the more unique "Matrix URIs", originating from an old post by Tim Berners-Lee, is also frequently used and fairly well known. Within Spring MVC these are referred to as matrix variables. Matrix variables can appear in any path segment, each matrix variable separated with a ";" (semicolon). For example: "/cars;color=red;year=2012". Multiple values may be either "," (comma) separated "color=red,green,blue" or the variable name may be repeated "color=red;color=green;color=blue". If a URL is expected to contain matrix variables, the request mapping pattern must represent them with a URI template. This ensures the request can be matched correctly regardless of whether matrix variables are present or not and in what order they are provided. Note that to enable the use of matrix variables, you must set the removeSemicolonContent property of RequestMappingHandlerMapping to false. By default it is set to true. The MVC Java config and the MVC namespace both provide options for enabling the use of matrix variables. If you are using Java config, The Advanced Customizations with MVC Java Config section describes how the RequestMappingHandlerMapping can be customized. In the MVC namespace, the <mvc:annotation-driven> element has an enable-matrix-variables attribute that should be set to true. By default it is set to false. Consumable media type expressions can also be negated as in !text/plain to match to all requests other than those with Content-Type of text/plain. Just like with consumes, producible media type expressions can be negated as in !text/plain to match to all requests other than those with an Accept header value of text/plain. Request 或 response 对象 (Servlet API). 选择任意指定的 request 或 response 类型，如ServletRequest o或 HttpServletRequest. java.io.OutputStream / java.io.Writer 用于 产生 response 的内容。这是 Servlet API 暴露的原生 OutputStream/Writer. @MatrixVariable annotated parameters for access to name-value pairs located in URI path segments. See the section called “矩阵变量”. @RequestParam 注解参数，可访问指定 Servlet request 参数。参数值会被转换为方法参数的类型。可查看the section called “使用 @RequestParam 将请求参数绑定到方法参数”. org.springframework.web.servlet.mvc.support.RedirectAttributes to specify the exact set of attributes to use in case of a redirect and also to add flash attributes (attributes stored temporarily on the server-side to make them available to the request after the redirect). RedirectAttributes is used instead of the implicit model if the method returns a "redirect:" prefixed view name or RedirectView. Command or form objects to bind request parameters to bean properties (via setters) or directly to fields, with customizable type conversion, depending on @InitBinder methods and/or the HandlerAdapter configuration. See the webBindingInitializer property on RequestMappingHandlerAdapter. Such command objects along with their validation results will be exposed as model attributes by default, using the command class class name - e.g. model attribute "orderAddress" for a command object of type "some.package.OrderAddress". The ModelAttribute annotation can be used on a method argument to customize the model attribute name used. org.springframework.validation.Errors / org.springframework.validation.BindingResult 已执行的命令或表单对象的验证错误(the immediately preceding method argument). org.springframework.web.bind.support.SessionStatus status handle for marking form processing as complete, which triggers the cleanup of session attributes that have been indicated by the @SessionAttributes annotation at the handler type level. org.springframework.web.util.UriComponentsBuilder a builder for preparing a URL relative to the current request’s host, port, scheme, context path, and the literal part of the servlet mapping. JDK 1.8’s java.util.Optional is supported as a method parameter type with annotations that have a required attribute (e.g. @RequestParam, @RequestHeader, etc. The use of java.util.Optional in those cases is equivalent to having required=false. A ModelAndView object, with the model implicitly enriched with command objects and the results of @ModelAttribute annotated reference data accessor methods. A Model object, with the view name implicitly determined through a RequestToViewNameTranslator and the model implicitly enriched with command objects and the results of @ModelAttribute annotated reference data accessor methods. A Map object for exposing a model, with the view name implicitly determined through a RequestToViewNameTranslator and the model implicitly enriched with command objects and the results of @ModelAttribute annotated reference data accessor methods. A View object, with the model implicitly determined through command objects and @ModelAttribute annotated reference data accessor methods. The handler method may also programmatically enrich the model by declaring a Model argument (see above). A String value that is interpreted as the logical view name, with the model implicitly determined through command objects and @ModelAttribute annotated reference data accessor methods. The handler method may also programmatically enrich the model by declaring a Model argument (see above). void if the method handles the response itself (by writing the response content directly, declaring an argument of type ServletResponse / HttpServletResponse for that purpose) or if the view name is supposed to be implicitly determined through a RequestToViewNameTranslator (not declaring a response argument in the handler method signature). If the method is annotated with @ResponseBody, the return type is written to the response HTTP body. The return value will be converted to the declared method argument type using HttpMessageConverters. See the section called “使用 @ResponseBody 映射响应体”. An HttpEntity<?> or ResponseEntity<?> object to provide access to the Servlet response HTTP headers and contents. The entity body will be converted to the response stream using HttpMessageConverters. See the section called “使用 HttpEntity”. An HttpHeaders object to return a response with no body. A Callable<?> can be returned when the application wants to produce the return value asynchronously in a thread managed by Spring MVC. A DeferredResult<?> can be returned when the application wants to produce the return value from a thread of its own choosing. A ListenableFuture<?> can be returned when the application wants to produce the return value from a thread of its own choosing. Any other return type is considered to be a single model attribute to be exposed to the view, using the attribute name specified through @ModelAttribute at the method level (or the default attribute name based on the return type class name). The model is implicitly enriched with command objects and the results of @ModelAttribute annotated reference data accessor methods. 使用 @RequestParam 的参数默认是必须提供的，当然，你可以指定其为可选的，将 @RequestParam 的 reqired 属性设置 false 即可。(如, @RequestParam(value="id", required=false)). 上述例子获取了 MyRequestHeader 头字段的值，以字节数组的形式读取了请求体，随后将 MyRequestHeader 添加到 response，将 Hello World 写到响应流和设置响应状态码为 201(Created). To customize request parameter binding with PropertyEditors through Spring’s WebDataBinder, you can use @InitBinder-annotated methods within your controller, @InitBinder methods within an @ControllerAdvice class, or provide a custom WebBindingInitializer. See the the section called “使用 @ControllerAdvice 注解增强控制器” section for more details. Classes annotated with @ControllerAdvice can contain @ExceptionHandler, @InitBinder, and @ModelAttribute annotated methods, and these methods will apply to @RequestMapping methods across all controller hierarchies as opposed to the controller hierarchy within which they are declared. spring-test 模块提供了一流的测试类，支持测试注解控制器。详情可查看Section 10.15.6, “Spring MVC Test Framework”.